LONDON/TOKYO (Reuters) - Japan's Hitachi Ltd <6501.T> put a $28 billion nuclear power project in Britain on hold on Thursday, dealing a blow to the country's plans for the replacement of aging plants. 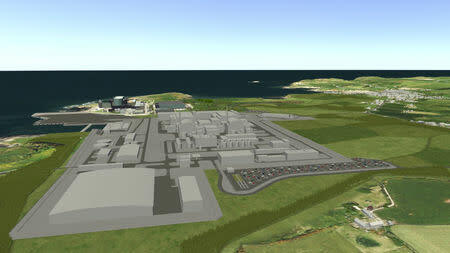 Hitachi's UK unit Horizon Nuclear Power failed to find private investors for its plan to build a plant at Wylfa in Anglesey, Wales, which was expected to provide about 6 percent of Britain's electricity. "We've made the decision to freeze the project from the economic standpoint as a private company," Hitachi said, adding it had booked a write-down of 300 billion yen ($2.8 billion). Higashihara, however, denied turmoil over Britain's impending exit from the European Union had any impact on Hitachi's decision to freeze the project. People close to the matter had previously said it had limited the government's capacity to devise plans. China's General Nuclear Services, an industrial partnership between China General Nuclear Power Corp (CGN) and French utility EDF <EDF.PA>, plans to make a number of investments in Britain’s nuclear power sector, most notably the Hinkley Point C project in southwest England. China's CGN told Reuters it would bring forward plans to build a nuclear plant in Bradwell, eastern England, helping to plug a potential supply gap. Britain wants new nuclear plants to help replace its aging fleet of nuclear and coal plants coming offline in the 2020s, but high up-front costs have deterred construction. Another Japanese firm, Toshiba Corp <6502.T>, scrapped its British NuGen project last year after its U.S. reactor unit Westinghouse went bankrupt and it failed to find a buyer. The investment would not even be able to compete with unsubsidized offshore wind, the most expensive renewable energy technology, Schneider said. "Time for the UK government to come up with a plan B," Schneider added. Should You Invest In Warehouse REIT plc (LON:WHR)?